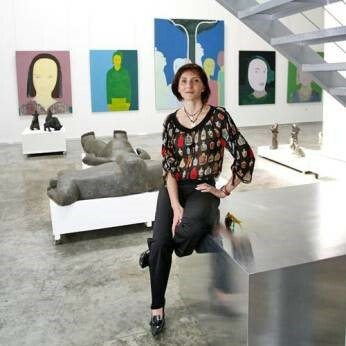 Amel B. Makkawi of artsawa tells us how her new gallery in Dubai will help promote art in the region. A new art gallery opened in Dubai. artsawa will feature world-class regional contemporary art from as many as 13 artists from the Middle East, North Africa and neighbouring countries. Set in an Al Quoz warehouse that has been transformed into a distinctive state-of-the-art 12,000 sq ft art platform with over 3,000 feet of linear wall space, artsawa promises to be the perfect backdrop to showcase the works of the region`s contemporary artists. "artsawa is the embodiment of my dreams and aspirations for the promotion of art in the region. Sawa in Arabic means together and based on that theme, artsawa`s mission is dedicated to promoting contemporary art from the region to a global audience," said Amel B. Makkawi, founder and owner of artsawa. "Art is the medium that binds people from different backgrounds. It comes from the soul and is a documentation of an artist`s real life experiences; it is a reflection of our society as a whole. artsawa will provide the stage for these stories to be told and for others to enjoy." Following completion of her architectural studies from Algeria, Amel moved to Paris, and then to Geneva where after enrolling in the Ecole de Decor de Theatre she began working as a freelance artist. Having moved to Dubai, Amel felt that there existed an unfulfilled longing for art and culture within the multi-cultural city. Filled with a passion for art from an early age, Amel set her talents to work to create a platform that would provide artists from across the region with a space where their work would be presented and globally recognised. Not just another gallery, artsawa aims to become the hub of contemporary regional art in Dubai, offering an interactive gallery space for artists. The gallery will further encompass a video lounge and a library, housing a rare and exclusive collection of books on topics related to art.